Selecting the right software is an investment of time and money that can pay off with increased customer loyalty, more productive employees, and simpler business management. 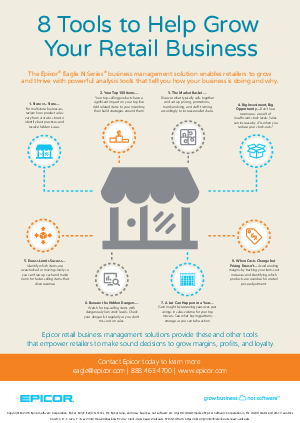 The Epicor® Eagle N Series® business management solution enables retailers to grow and thrive with powerful analysis tools that tell you ow your business is doing and why. Store vs. Store-For multistore businesses, review how product sales vary from store to store to identify best practices and resolve hidden issues. Your Top 100 Items- Your top-selling products have a significant impact on your top line. Add related items to you inventory, then build strategies around them. 3. The Market Basket- Discover what typically sells and set up pricing, promotions, merchandising, and staff training accordingly to increase wallet share. 4. Big Investment, Big Opportunity- Don’t lose revenue as a result of insufficient stock levels. Sales can increase by 4% when you reduce your stock-outs. 5. Excess Limits Success- Identify which items are overstocked or moving slowly so you can free up cash and make room for faster-selling items that drive revenue. 6. Beware the Hidden Dangers- Watch for top-selling items with dangerously low stock levels. Check your danger list regularly so you don’t miss out on sales. 7. A lot Can Happen in a Year- Gain insight by reviewing year-over-year swings in sales volume for your top movers. See what buying patterns emerge so you can take action. 8. When Costs Change But Pricing Doesn’t – Avoid eroding margins by tracking your item-cost increases and identifying which products are overdue for a retail price adjustment. Download this tip sheet to get more insight into these 8 powerful analysis tools that will help grow your retail business.